(From Pentax lens literature) The Pentax SMC P-FA 28-90mm f/3.5-5.6 standard zoom lens is ideal for both beginner and advanced photographers. It features super-compact dimensions and covers the most frequently-used focal length range from 28mm wide angle to 90mm telephoto. Its extra-compact, lightweight body measures 2.6" x 2.7" and weighs just 6.9 ounces. 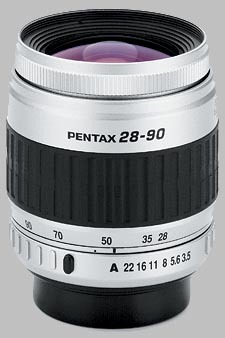 The Pentax 28-90mm f/3.5-5.6 SMC P-FA doesn't have any user reviews yet!